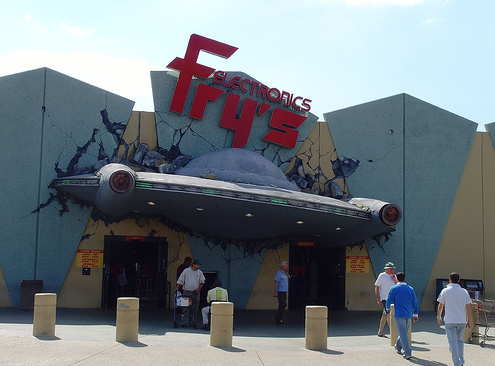 If you’ve never wished you lived near a Fry’s Electronics and never want that thought to cross your mind, we suggest you don’t read any further. Seriously, stop reading. Ok, fine, but don’t say we didn’t warn you. The not-so-big box retailer must be on Sony’s good side lately as they were able to score some pretty snazzy Greatest Hits and DualShock 3 bundles to not only entice their customers with, but also make them regret hastily spending that tax return Uncle Sam sent. Not unlike the Uncharted bundle we were treated with last year, these Fry’s-only exclusives include a DualShock3 controller with your choice of either Killzone 2, Infamous, Resistance 2, or Little Big Planet Game of the Year Edition. All yours for about $60 and change when they become available in May. Granted you haven’t already had the chance to experience these pretty amazing titles and are in need of an extra pair of sticks, this deal’s not too shabby if you ask us. Also, we wouldn’t be doing our jobs (read: looking our for you) if we didn’t mention that in-store and online prices for Fry’s are sometimes inconsistent, so your mileage may vary. We suggest calling ahead before making that trip, and if your local store is anything like the one pictured, it may be your last.